FILE - In this photo taken July 18, 2015, people attending a ceremony stand near a mausoleum that was restored in Timbuktu, Mali. A suspect in the destruction of buildings in Mali's ancient city of Timbuktu, which is a UNESCO World Heritage Site, has been handed over to the International Criminal Court in The Hague. Niger surrendered Ahmad al-Faqi al-Mahdi, also known as Abou Tourab, to the court Saturday. ICC Prosecutor Fatou Bensouda said in a statement that al-Mahdi's detention "is a welcome development." Bensouda said al-Mahdi was a "zealous member" of the armed Islamic extremist group Ansar Dine. The prosecutor said the attacks were "a callous assault on the dignity and identity of entire populations, and their religious and historical roots." The suspect is accused of intentionally orchestrating attacks on the sites in 2012. The extremists, who considered the structures as totems of idolatry, were driven out nearly a year later by the French military. No date was immediately set for al-Mahdi's arraignment. 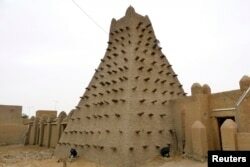 FILE - A traditional mud structure stands in the Malian city of Timbuktu, May 15, 2012. Founded in the fifth century, Timbuktu was an intellectual and spiritual capital, and a center for the propagation of Islam throughout Africa in the 15th and 16th centuries.